The Hon. Chief Judge of Edo State Judiciary, Hon. Justice Esohe Ikponmwen, has been installed as the Patroness, Boys Brigade, Nigeria. Speaking at the Decoration ceremony which took place at the High Court in Benin City, Hon. Justice Esohe Ikponmwen said she was grateful to God and to everyone for the hour bestowed on her, explaining that she was elated to learn of the vision of Boys Brigade, Nigeria, and as it is founded on the Gospel of the Lord Jesus Christ, she would whole heartedly embrace it since it was another opportunity for her to serve and spread the Gospel. The Hon. Chief Judge further thanked those who had been strengthening the organization, while promising to uphold the tenets of the association in appreciation of her call in this area of service. Earlier, while decorating the Chief Judge, the State President, Boys Brigade, Nigeria. Edo State Council, Mr. Lawson Akhideno, said investing Hon. Justice Esohe Ikponmwen as a State Patroness of the Organization was a dream come true for them, as they were assured that the vision and mission of Boys Brigade, Nigeria would be accomplished in Edo State. The State President likened the investiture ceremony to the story of the sick man in the Bible, who had no man to help him, emphasizing his strong belief that God would use Hon. Justice Esohe Ikponmwen to uplift Boys Brigade in Edo State. Mr. Akideno further congratulated the Hon. 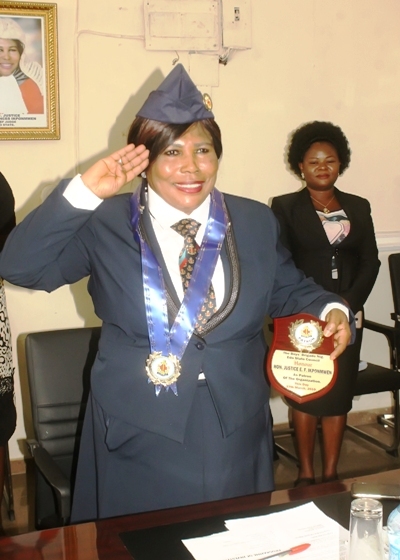 Chief Judge on the investiture and formerly welcomed her to Boys Brigade, Nigeria, whose objective is the advancement of Christ’s Kingdom among Boys and promotion of habits of obedience, reverence, discipline, self-respect and all that tends towards a true Christian manliness. No fewer than 74 inmates were recently freed from the Benin and Oko prisons as the presidential Committee on Prisons Reform and Decongestion visited Benin City, Edo State. The inmates, who had been sentenced over crimes ranging from breach of peace, malicious damage, unlawful assault, fraud, conspiracy, breaking and stealing, were excited at the prospect of reuniting with their families. Releasing them, the Head of the Presidential Committee on prisons Reform and Decongestion, and Chief Judge of FCT, Abuja, Chief Justice Ishaqu Bello, admonished the freed inmates to desist from acts that could get them back to prisons in future, maintaining that crimes do not pay. The inmates who had learnt some trades while in custody were given some amount of money toenable them to set up their businesses and have means of livelihood, so as to shun crimes. On her part, the Hon. Chief Judge, Edo State Judiciary, Hon. Justice Esohe Ikponmwen, charged the freed inmates to eschew life of crimes in the future as their loved ones suffered the most from their conviction. Earlier, while on a courtesy call on the Governor of the State, Mr. Godwin Obaseki, Hon. Justice Bello informed the Governor that Edo State was the 14th State the Committee had visited while fulfilling their mandate of reforming and decongesting Prisons across the nation. 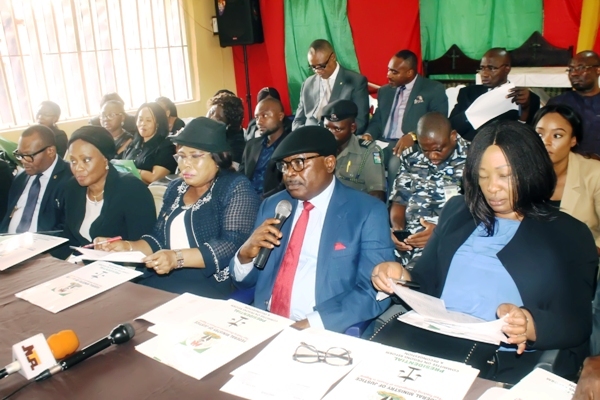 Present at the decongestion exercise were the Chief Judge of Edo State Judiciary, Honourable Justice Esohe Ikponmwen, the Attorney General of Edo State, Professor Yinka Omorogbe, Deputy Comptroller of Prisons, Edo State Command, Joseph Usendiah.